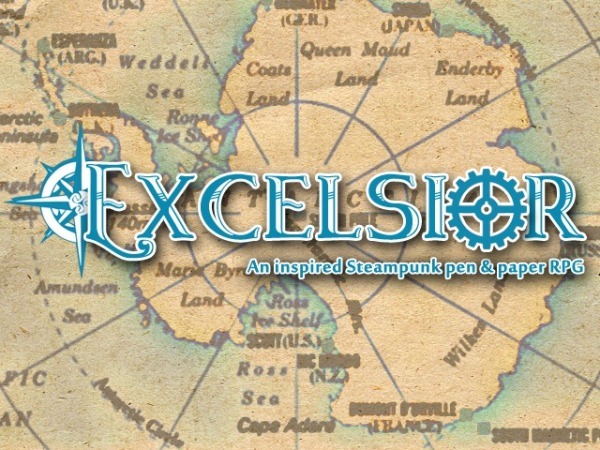 Excelsior is a pen and paper role playing game whose setting is modeled after the original classics of literature that inspired what would eventually become the Steampunk movement. Although the setting can be interpreted as very “Journey to the Centre Of The Earth,” we tried to imagine what HG Wells or Julies Verne would have written about if they had dreamt up human augmentation in the form of Biomechanics or powered exoskeleton armor as well as (and I’m trying not to give too much away here) discovering other forms of humanoid life. In terms of gameplay, Excelsior is an RPG that uses a percentile system that determines player success for attack and skill tests. We’ve done a significant amount of testing and we think we have a system that will be easy for people new to RPGs to pick up, as well as some new mechanics and options for customization that will keep seasoned players interested as well. It all started with me getting discouraged at finding my type of Steampunk RPG. In a lot of cases the games that I was looking at were either very rules light and not very well written or just Steampunk overlays for rule systems put out by larger publishers. Either way, I couldn’t find what I was really after so I decided to mess around with a rule set and some setting ideas that (two years later) would become the Excelsior core rules book. This is really tough to answer because I’ve been looking at so many different types of sources for so long that it’s really difficult to distill the answer into something that doesn’t go on forever. In terms of the setting, I’ve mentioned a number of Victorian writers, but story wise I’d say that nobody knows how to make an RPG setting more interesting for players than Ed Greenwood. Again, we don’t want to give away too much, but the Excelsior setting has a lot of intrigue that draws inspiration from the worlds that Ed writes about. We took a look at the most popular RPG systems out there and saw what we liked and what we didn’t like in terms of story as well as mechanics. Excelsior relies on character attributes that are similar to other existing systems, but with our own twist. We saw emerging trends in game development and took notes. Our sources are too numerous to mention, but we did our best to look at game developers big and small and see what we could do in terms of intent boiling down into mechanics with a style of play that we would be proud to call our own. We’re new at this, but the one thing we’ve learned is that you can’t have great art without a great relationship with the artist. We’re fortunate to have teamed up with Mark and John to help our vision of Excelsior come to fruition. Now, on to the art direction! These days, it’s not enough to tell an artist “make a Steampunk character.” The scene has way too much variation, so we knew we had to be focused enough in our direction so that the work produced matches our vision, but still give the artist enough creative freedom to make things fun for them too. While there’s lots of monocles and rivets to go around, we’re going a little more into Sci-Fi in terms of what our readers can expect while still shooting for a look that plausibly would have been around in the mid to late 19th century. It’s a tough balancing act. 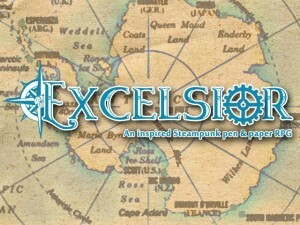 Excelsior is a snap for new players and fun for seasoned players. We provide a system for them to play their favorite type of Steampunk without having to learn a lot of the tricky lexicon that is found in a lot of the published games found today. Combat and Skill tests are fast and fun to allow for as much storytelling or combat a group of players want. Most importantly, we are very proud of our invention system, which allows for the construction of player inventions for use in game. We worked very hard on this portion, as recognize that this creative portion of the Steampunk genre is severely lacking in other games today. Excelsior still uses character stats, something similar to hit points, talents, and other more traditional elements found in the more popular RPG titles, with the exception that everything is going to be percentile based, so all you really need is two ten-sided dice regardless if you’re shooting your elephant gun at a t-rex, administering first aid to an ally, or installing a pair of biomechanical rocket legs. This allows for more action and challenges as well as more room for roleplaying and storytelling without getting bogged down with a lot of specific terminology and hunting down the correct dice for the right action or damage type. We spent a lot of time picking apart pen and paper RPG game engines and took a look at what we liked and took inspiration from a list of sources too numerous to mention. Once we had an idea for basic character classes and rules sets, we did some iterative play testing to see how things felt in terms of the ebb and flow of game play. We think we are at a good point in terms of having a marketable set of core rules, but we’re really excited to hear feedback from our backers once our Kickstarter successfully funds. As for the setting, we drew heavy inspiration from Jules Verne and HG Wells’ most famous works and crafted the world of Excelsior. While we don’t have Morlocks, the setting does provide for some great storytelling in terms of how technology was changing the world (for better or worse) during the time in mankind’s history that Excelsior takes place. Massive Space 1889 Double: The Ether Calculator & On the Trail of the Gods Release!